Stefano Bertozzi, who has led the School of Public Health for 5 years, will step down from his position effective July 1, 2018. He will remain as a full-time member of the School’s faculty in the Division of Health Policy and Management. 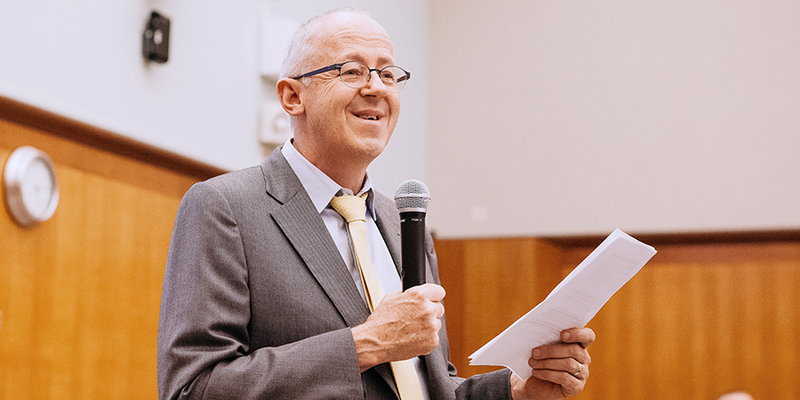 Bertozzi’s time as dean was shaped by financial challenges for the School and campus, but also defined by growth in educational opportunities and collaborative initiatives that will increase the School’s ability to respond to complex public health challenges in California and around the world. Bertozzi led the School through an extensive reaccreditation process with the Council on Education for Public Health, which resulted in the School being reaccredited through July 1, 2023. When faced with the large campus budget deficit, Bertozzi led an effort to chart a more sustainable financial future for the School through a combination of fundraising, spending reductions, and enrollment growth in the professional degree programs. The School has made substantial progress in reducing its operation deficit in the past two years. In announcing his transition, Paul Alivisatos, Berkeley’s Executive Vice Chancellor and Provost, remarked that Dean Bertozzi was instrumental in helping the School build several new cross-unit, cross-campus, and international collaborations over the past 5 years. These include online programs in hospital management and regulatory science as part of the UC–Mexico initiative, the UC Berkeley/UCSF Data Science Fellowship, and a global health track for the School’s Online MPH program. As well, the School established a joint BS-MPH program with Hong Kong University and a public health scholars exchange program with Peking University. The School developed the Fung Fellowship for Wellness and Technology with the College of Engineering and collaborated with six other schools on campus as part of the Berkeley Food Institute. During his tenure, the School also launched the Center for Targeted Machine Learning and Causal Inference, an important initiative to develop methods for analyzing large health datasets. And the School has been recognized as a best practice model for student internships and professional development. "On behalf of the faculty of the School of Public Health, I offer my gratitude for Dean Bertozzi's leadership over the past five years," said Amani Nuru-Jeter, associate professor of Community Health Sciences and Epidemiology, and chair of the School's Faculty Council. "We have faced many challenges including a shrinking faculty and budgetary constraints. However, his optimism and efforts to develop innovative strategies for financial growth have been significant. I look forward to continuing to work with him as a faculty colleague." In his last semester as dean, Bertozzi will continue to oversee the School’s move from University Hall into a new building on Berkeley Way. And the School will be honoring its legacy and looking forward to a bright future as part of its 75th Anniversary celebration and UC Berkeley’s 150th.